FROM THE US OPEN – Well, that was some kind of a match. We’re talking about the quarterfinal clash between Rafael Nadal and Dominic Thiem. The Spaniard was so close to losing, but he kept hanging in there, running and running. He simply never gives up. He may not play particularly well, but he will continue to push himself to a level beyond other players. At the end, against the now fantastic Thiem, Nadal looked in deep down and found the solution, winning 0-6, 6-4, 7-5, 6-7(4), 7-6(5). Good enough. Now, the 17-time Grand Slam champion has to face Juan Martin del Potro, who won it nine year ago, in 2009. The 32-year-old Nadal has also won the US Open three times in 2010 and 2013. Last year, he won again over Kevin Anderson, somewhat quickly. Recall back in 2009, when DelPo crushed Nadal in the semis. The Argentine was red hot, as he shocked the famous Roger Federer in five sets in the final. At that time, Nadal said that DelPo played amazing tennis, but it won’t happen again. Well, he has, once in a while, but not against Nadal again. The Spaniard has beaten him 11 times, while DelPo has won five. Last year at the USO, in the semis, Nadal beat him 4-6, 6-0, 6-3, 6-2. Clearly, DelPo was exhausted after a couple hours, but Nadal nailed his forehand all the time. This year at Wimbledon, in the quarters, on Nadal edged him, 7-5, 6-7(7), 4-6, 6-4, 6-4. That was a toss-up, but Nadal served extremely well. However, DelPo has improved this year, a lot. He is now ranked No. 3 and he could go further. He now can hit his two-handed backhand, where for many years, he couldn’t, because his left leg was almost destroyed and broken. It is hard to predict how long he will continue to be healthy. Hard to say month to month. No one really knows, but on Friday here at Flushing Meadows, he shouldn’t be tired or hurt when he walks on the court. 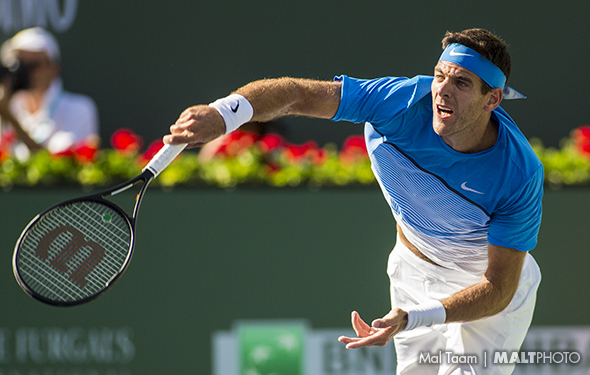 DelPo does love to slice his one-hander. When he is on top of it, he will hit it very low. But look, Nadal can knock it with his huge forehand, time and time again, and that is why he has won many matches. He belts the ball. Nadal has played very long contests in the last three matches. His serves are very good, but over the past 11 days, he is not crushing it. I am not sure exactly why, but against DelPo, if he can, Nadal has to nail it on the Ts. DelPo has to find away to break him, which means that he has attack on his backhand, and keep him off the baseline. Even if he does, he has to be patient. Of course, this will go five, with a long service game. In the end, DelPo will figure him out and win it, say 6-3 in the fifth. Just one break and hold on.